Perfectly located in a hillside olive grove, apparently in splendid isolation with breathtaking views of hills, the town of Orte, and the Tiber Valley, Casale alle Morre is in fact attached to a charming and lively little village and is in easy reach of Rome, Florence, Orvieto, the Etruscan cities of Viterbo and Tarquinia, and all the Umbrian hilltowns. A gentle path leads up to the magnificent “lap” pool in natural stone and sand-colored tiles behind the house, protected by a natural forest, dotted with olive trees, with an even greater view of the valley and the tile-roofed back of the house and its lemon-house annex. The villa was constructed completely new in 2006 from the very stones of a ruined farmhouse on the property, so that it is full of light and air and modern space, but looks as though it has always been there. Its magnificent southern-facing portico dominating the valley is protected from the sun all summer and warmed by it in the cooler months. The village of Penna: 5-10 minutes' walk up a shady lane is the flourishing village of Penna (population 1000), equipped with post office, bank, parish church, pharmacy, and shops in a thriving community of local people of all generations active in the agricultural and civic life of their village. The calendar year is studded with festivals, such as the open air banquet to celebrate the vendemmia (or grape harvest) in mid-October, outdoor music and dancing for the village holiday in early August, streets strewn with flowers for the Corpus Domini in June. Penna’s tiny historical center, in the shape of a feather (hence its name) is anchored between the very active parish church and the belvedere (panoramic overlook on the Tiber river valley and Mount Cimino beyond). The town also boasts an impressive mechanical Presepe (Nativity Scene) open to visits all year round. An Umbrian family story: The villa is on a working farm (olives and grapes), that has been in our family for almost two centuries. The historic family home is close by, in the village. The adjacent 'limonaia' houses potted lemon trees in the winter, ping-pong in the summer. The apartment above the limonaia is not for rent and is occasionally occupied by the owners. This is the authentic Italy, far from its mass tourism and yet in easy range of so many of its legendary beauties. The family has been in the village since at least the 19th century. The old family house is in the town, outside the village walls. The villa was built with the stones of the ruined sharecropper's house in 2006. The villa has made it possible to experience in comfort the perfect beauty and tranquillity of this spot on what was a traditional Umbrian farm. The vicinity to Rome (45 minutes by train from the station of Orte, 15 minutes away by car; or 1.5 hours by car on the Autostrada) makes this peaceful hideaway remarkably accessible. It is also close to all the famous hilltowns. Penna itself has very few tourists. The beautiful, natural-looking pool means it is never too hot. The house is on a hillside olive grove 30 meters down a lane from the village. Wireless internet is included. €100 cleaning fee due in cash to third party on arrival. Heating surcharge in cold months depending on usage. We spent 11 days in this villa and had a wonderful time. The villa is exactly as it looks in the photos with comfortable bedrooms and a very good living space. As others have said, there are well stocked supermarkets nearby and in Penna itself, there is a small store and a lovely restaurant within walking distance. Maura, the housekeeper, is a wonderful cook and prepared several delicious 3 course meals which was a fantastic bonus. The villa is an easy drive from Rome, just over an hour, and well placed to visit the many beautiful hilltop towns like Orvieto and Amelia. The pool which is not visible from the house is totally secluded and a good size for swimming lengths or messing around. Our children found the floor of the pool rough on their feet (as they spent hours in the pool!) but otherwise it was always refreshingly cool. Shade is limited as it's only provided by the olive trees around the pool but there was generally a lovely breeze. Beach towels are needed for beside the pool. I would thoroughly recommend this villa for its secluded position but yet it is within walking distance of a pretty village and easy driving distance of other towns. The views on the patio are quite breathtaking, looking down the valley past the olive, fig and lemons trees, it was spectacular to sit there at any time of the day. We spent a week in this lovely villa together with another family. All up, there were 4 adults and 5 children (ages 5 to 10) and the villa was perfect for this number. The villa is very well designed with enough bedrooms, bathrooms and living spaces so that people do not feel on top of each other. It has the 'look' of a traditional villa, but all of the modern comforts and features you need to make life easy. The kitchen is very well equipped and the gardens and grounds are great for kids to explore and roam. The pool is wonderful and hours and hours were spent in it. We also enjoyed spending time in the little town of Penna. We were quite literally the only tourists in town, which is no mean feat for Umbria in the height of the tourist season. We were all genuinely sad when it came time to leave. It will be a week we reminisce about for years to come. There are not enough good things to say about our stay here. We were a party of five and we all loved it. To say that it exceeded our expectations is an understatement. The villa, seemingly old but actually fairly new, is beautifully designed, laid out and pleasantly comfortable. When we were there, usually in the mornings and from late afternoon on, we lived on the covered terrace which overlooks the truly magnificent view of the Tiber Valley. Breathtaking. We ate our meals there, arranging the five seats at the long table so we all could see the splendid panorama, like a Hollywood film set, before us. We took advantage of the wonderful Maura who prepared excellent four course meals for us. Every night something different. She is terrific. However, if you want to do meals yourself, that is easily accomplished as the kitchen is fully stocked and there is a terrific COOP store in the nearby town of Amelia. But we were thrilled to have Maura bring us her meals every evening. Renting a car, we were able to do day trips to the endless nearby towns every day. Orvieto, Todi, Viterbo, Narni, Amelia, the list goes on. The pool, when we were home, was inviting and cool and the perfect place for relaxing on a hot summer day. Paolo and Alison have done a wonderful job and we hope that we will be able to return again in the future. We miss it already. This house is such a cleverly and lovingly made thing -- the pieces of an old farmhouse resurrected from the land that Paulo and Alison know well, on which olives and lemons and roses grow, and on which guests can now spend beautiful weeks suspended between the water of the hillside pool and the blue sky. An evening on the terrace eating cheese from the buffalo farm next door and drinking wine made from grapes on the property is not to be beaten. And the wider setting, which make Rome close but not overwhelmingly so, and is dotted with ancient sites (we saw Etruscan tombs and Roman cisterns on short day trips) lovely fortified hilltop towns is perfect. We are so grateful to have stayed here! Great stay in Umbria, a wonderful home! 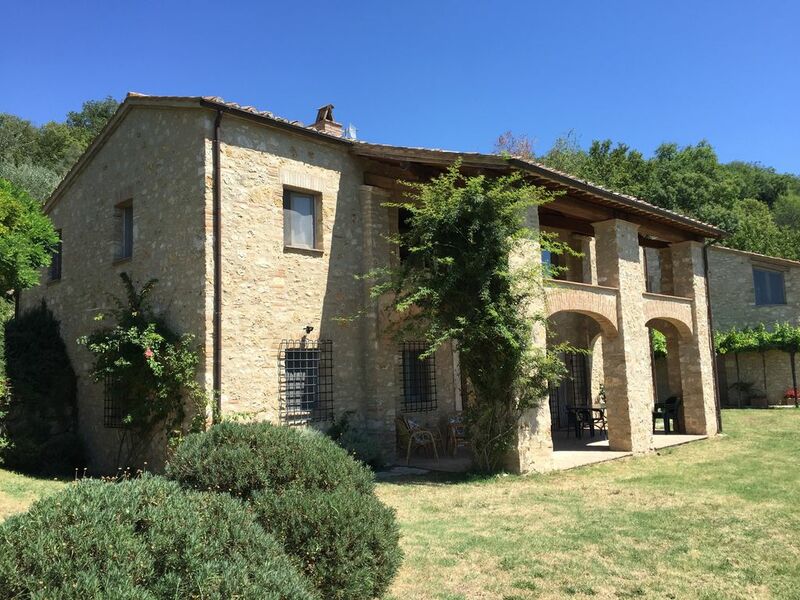 We spent a week in Umbria, and this home was a perfect spot for our family. The house is finished beautifully down to the detailed ironwork and hand crafted wooden doors. The villa was spacious with all the modern amenities and the home was spotless, with everything for our stay waiting. Conveniently located an hour from Rome and close to many hill towns made this ideal for us to do daily road-trips. This was a perfect place to enjoy amazing panoramic views while eating dinner outside on the patio, or swimming in the pool perched upon the hillside surrounded by olive trees. The lovely village of Penne where the villa is located has markets, a bakery, a pub and is walking distance. As a runner I found this a perfect spot to start out from and go exploring the countryside, looping through hills with spectacular views every turn. My family had a wonderful experience and would recommend staying here to anyone interested in the beauty of the Italian countryside. This was my first time to Umbria after having stayed in Tuscany 3 years ago. This villa provides a spectacular view in a recently built villa with modern amenities such as a washer and dishwasher and screens on the windows which are rare in most Italian villas. We spent time enjoying the pool and the 500 year old olive trees on the grounds of the original farmhouse, as well as venturing into the charming town of Penne. This villa is comfortable , quiet and picturesque, and is driving distance from Perrugia, Deruta, the Mediterranean, and a train ride to Rome. The kitchen is well stocked, with upscale appliances and the ping pong table provided entertainment for everyone old and young. I would highly recommend this lovely villa to anyone who will find it far above standard compared to most villas. We thoroughly enjoyed our vacation here and plan to visit again. On the border with Lazio, the villa stands at the gateway of all the Umbrian hilltowns (Orvieto, Assisi, Perugia, Todi, Spoleto, Narni, Gubbio), but also an easy distance from the volcanic Etruscan towns of Viterbo and Tarquinia and the Tuscan seaside (Capalbio, Ansedonia, the island of Giglio). It is also close to the Appenines and river rafting on the Nera near the waterfalls of Marmore, some of the highest in Europe. Because of the vicinity of the Orte train station (15 minutes' away by car) Rome and Florence are easy daytrips -- without the worry of a car. A €100 cleaning fee is due in cash to third party on arrival. A heating surcharge will be applicable in the cold months.